Before reading Loving Eleanor, I had never heard or remember hearing about Lorena Hickok and I knew very little about Eleanor Roosevelt. Sure I knew she was the wife of the President Franklin Delano Roosevelt but aside from that my knowledge was pretty limited. 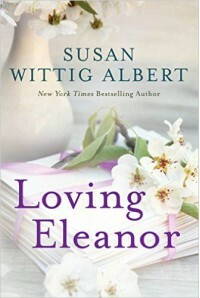 Loving Eleanor was also the first historical book I had read about Eleanor. Lorena Hickok, a successful journalist when it was not a thing for women to be out on their own working especially in a man's career field. Aside from being a close friend of Eleanor's for all of their lives, she was a journalist working for various newspapers and became very well known. Her friendship with Eleanor developed from an interview that she wrote during FDR's first campaign for president. She lived in the White House for a good portion of FDR's presidencies. She became an investigator for FERA, Federal Relief Administration during FDR's New Deal, traveling the country during the Depression on the living conditions of the people and reporting back to FDR with recommendations on how to improve conditions. Eleanor was also successful in her own right. From being a governor's wife to a reluctant first lady and then during the three full terms that FDR was president, she accomplished a lot. Various charities, volunteering for the Red Cross during WWII, worked on various political campaigns including FDR's, and assistant for the Office for Civilian Defence among other contributions. She also became a prolific author writing books and newspaper columns. Lorena never married as she was a lesbian and this book eludes to the extremely close and intimate relationship with Eleanor. Eleanor and FDR had a marriage in name only as FDR was not a faithful husband and Eleanor developed relationships with men also, anyone whom she could feel close to. This relationship with Lorena lasted the longest. After the death of FDR, they each continued doing what they were passionate about. I was very impressed with the research that went into the writing of this novel, giving the reader a glimpse into the private lives of these two remarkable women and how relationships with people can shape lives. Researched from over 3,000 letters written between Lorena and Eleanor over the span of their lifetimes. I really enjoyed this novel and had a few tears towards the end. I highly recommend reading this book, historical fiction based on fact, if you want to learn more about the FDR years and Eleanor and Lorena. I received a copy of this book for review for my honest and unbiased thoughts.